Yogurt in a pie? No way. That sounds weird and kinda gross...but then I tried it. Hands down. My favorite pie. End of story. This past month when the grandparents were in town, Tyler's mom whipped this up for us to try. It can be eaten without toppings. Or you can mix it up with fresh fruit or little chocolate chips. I'm not sure you could make it wrong. 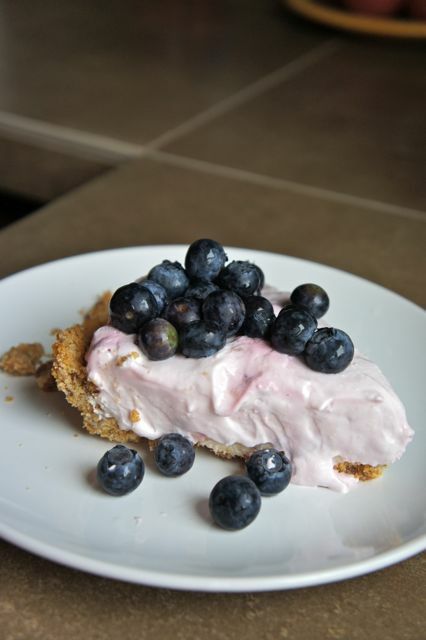 First make your graham cracker crust. Preheat your oven to 350. Mix your crushed graham crackers and chopped nuts with the butter. Press into 2 pie tins. Cook for 10 minutes. Let cool completely before filling. Second, mix together the vanilla, egg yolk, powdered sugar, and salt. If it's too thick, add some milk. If it's too thin, add more powdered sugar. 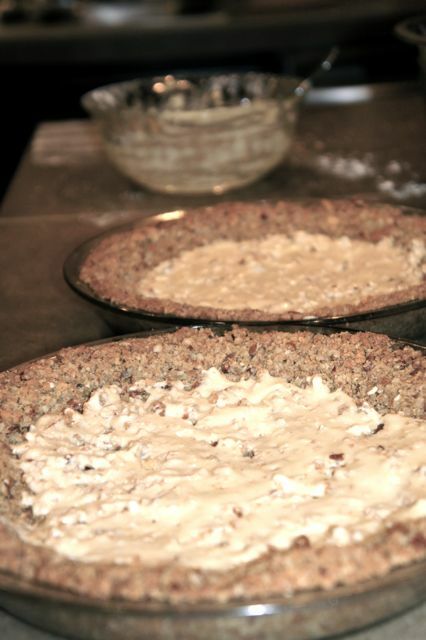 Divide in half and spread on the bottom of your pie crusts. Last, mix together the yogurt, cool whip, and fruit. Spread over the top of your pies. Let set for several hours or overnight. This allows the cool whip to firm the yogurt, preventing gooshing when the pie is sliced. Eat with or without toppings. The first powdered sugar layer. Spread thin and wide. Also, thanks to people leaving their garbage by the dumpster, we scored a Little Tykes Town Playhouse and Slide! I dragged it from the dumpster down the street. The kids thought we were pretty cool. I was happy for the $450 still in my pocket. I used to make a variation of this with my grandma when I was little. I love it!